Neymar with Brazil in 2018. 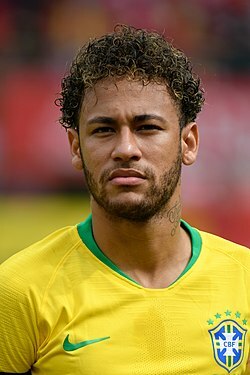 Neymar da Silva Santos Junior, known as Neymar or Neymar Jr. (born 5 February 1992), is a Brazilian footballer that can play as a left or right Winger or as a Striker. He plays for the French team Paris Saint-Germain and the Brazil national football team at international level. He has been compared to former Barcelona teammate Lionel Messi and also to Cristiano Ronaldo and Pelé. Neymar and his family moved to Santos in 2003, where he joined Santos F.C. On March 7 2009, he made his debut for Santos at 17 years of age. He scored his first goal against Mogi Mirim, a week after his debut. On April 15 2010, Neymar scored five goals for Santos, beating Guarani 8-1 in the 2010 Copa do Brasil (Brazilian Cup). The club would then go on to win that year's cup. In a Copa Libertadores match against Colo-Colo in 2011, Neymar got red carded for wearing a mask in his goal celebration. After Neymar's performances for Brazil's U-17 team at the 2009 U-17 World Cup, on July 26 2010, Neymar was selected in the squad for the Brazil national team by new head coach Mano Menezes for a friendly match against USA on August 10 2010. He scored on his debut, in a 2–0 win for Brazil. On March 27 2011, he scored twice in a 2–0 win against Scotland at the Emirates Stadium. In the summer of 2012 , Neymar was bought by the Spanish club FC Barcelona for 57 million euros from Santos. In August 2017, he was bought by the French club Paris Saint-Germain for a world record-breaking €222 million, making him the most expensive transfer of all time. ↑ 1.0 1.1 1.2 1.3 "Neymar". ESPN. This page was last changed on 4 April 2019, at 07:08.